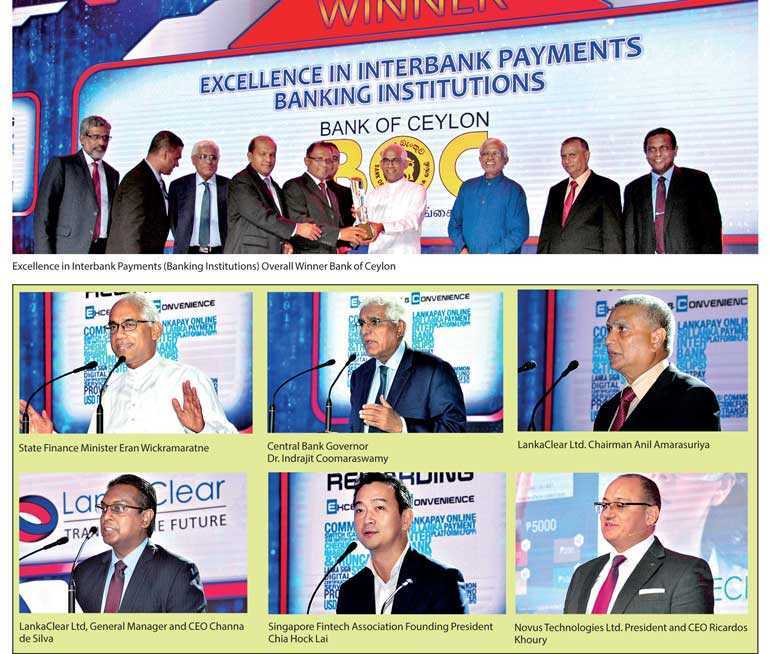 State-run Bank of Ceylon (BoC) bagged the pinnacle of ‘Excellence in Interbank Payments’, winning the Gold as the Overall Winner at the LankaPay Technnovations Awards 2018 organised by LankaClear Ltd., held last Friday to appreciate torchbearers of payment technology innovations in the country. Sampath Bank Plc won the Silver award as the Overall Runner-up under the Banking Institution category, while the Overall Merit award was secured by Commercial Bank of Ceylon Plc. Under the Financial Institutions category, LOLC Finance Plc was crowned Gold as the Overall Winner, while Commercial Leasing and Finance Plc bagged the Silver as the Overall Runner-up. The LankaPay Technnovation Awards is Sri Lanka’s first and only annual payment technology innovation awards and the second edition of the awards gave away 33 awards under 15 categories. The event was held under the patronage of Telecommunication, Digital Infrastructure and Foreign Employment Deputy Minister Manusha Nanayakkara, State Finance Minister Eran Wickramaratne and Central Bank Governor Dr. Indrajit Coomaraswamy. Delivering the opening remarks LankaClear Ltd. Chairman Anil Amarasuriya said as the operator of Sri Lanka’s National Payment Network, their objective was to lead the way as the country is ushered into a digital era by facilitating faster, convenient secure electronic payments under the direction and guidance of the Central Bank. “We are living in an extremely competitive era driven by creativity, innovation and evolution more than ever before in the history of human civilisation. Technological advancements and our ability to innovate have brought so much convenience to our lives that we can be omnipresent and carry out a transaction at any time with just a click of a button. This is what we strive for in everything we do at LankaClear by partnering with banks, non-banking financial institutes and fintech service providers,” he added. Throughout last year, Amarasuriya said they focused efforts on increasing the adoption of retail electronic payments by partnering with banks, financial institutes and fintech service providers, particularly promoting JustPay, its flagship retail payments initiative. In addition he highlighted on multiple thrusts, including partnering with the media to carry out targeted grass-root level campaigns to promote greater financial inclusion, supported by aggressive above-the-line (ATL) promotions to create widespread visibility for LankaClear’s primary brand, LankaPay. “We also put a significant emphasis on social media campaigns to gain traction in the tech-savvy banking customer space and expanded our reach to cover fintech service providers via the Facebook poll to determine the most popular payments products in the country, which is also scheduled to be recognised today,” he stressed. Initiated in 2017 LankaPay Technnovation Awards, Amarasuriya stated this would no doubt be a platform that thrusts banks, financial institutions and fintech service providers to be the leaders of this journey towards a less-cash economy. The Central Bank Governor Dr.Indrajit Coomaraswamy said LankaClear, under the guidance of the Central Bank, transformed the clearing systems of the country by introducing innovative technologies to improve the efficiency of retail payment mechanisms, driving Sri Lanka towards the objective of an efficient, green and paperless nation. “LankaClear has laid a solid foundation in building an integral electronic payment system for multiple domestic payment networks through establishing the National Payment Switch,” he commended. Outlining digitalisation of Government payments is another priority area, he said with the introduction of electronic payments to the Government sector, the payment and collection process of the Government will be streamlined, ensuring timely fund flows to the Government while reducing the cost of revenue collection. Dr. Coomaraswamy also said the Central Bank is committed to achieve a balance between regulation and innovation, as it is responsible for the people and the Government for the safety and security of public funds, and therefore would be open for forms of regulated digital currency such as Digital Fiat Currency. The awards ceremony also featured an international keynote speaker, Singapore Fintech Accosiation (SFA) Founding President Chia Hock Lai who shed light on to a topic of contemporary significance in relation to the future of payment technology adding further value to the audience. He said Asia was a clear leader in payments innovation. “FinTechs and digital transformation are leading in payments innovation. Asia is leading, being home to 64% payments innovation in the next two years, while Europe is catching up with progressive regulatory environment 14% and Africa 12%. Growing population, smartphone penetration and middle class are key factors,” he added. According to him, top five trends include open banking and APIs, data and security, role of regulator, role of mobile phones as well as blockchain and cryptocurrencies. He said integrated payments over the next three years will significantly increase, while Internet of Things (IoT) devices will drive the greatest payments volumes. Highlighting the biggest barriers to use data as lack of coherent data strategy, lack of expertise, isolated technology, regulatory concerns, lack of explicit customer consent and business security, he said large scale breaches of acceptance networks were the biggest security concern, while hacking of banking or processing systems and identity theft had also become concerns. “Regulation has caused the biggest challenge for new payment businesses,” he said, calling on central agencies to play an active role to ensure innovation is incentivised to promote financial inclusion. Lai said mobile technologies were offering the greatest potential with highest interoperability priority for mobile money, particularly in developing markets. In addition he stressed that blockchain would have the greatest impact on capital markets, legal and trade finance in the next few years. “Blockchain might be overhyped for payments,” he added. In terms of a life of a payments start-up he pointed out that despite many finding it easy to obtain early and late stage funding, a lot of start-ups find it challenging to obtain growth stage funding. “Most payment fintechs fail to scale. Collaboration is the way forward,” Lai emphasised. He also said compared to three years ago there were more collaborations at present. He asserted that unscalable business models, no advantages over existing solutions, regulations, insufficient funding, fierce competition and skills shortages were key reasons for payment start-ups to fail. Lai also noted that payment start-ups acquired by established payments players were most likely to be successful. Pointing out that most established payment firms were under threat, he said by partnering with start-ups, acquiring start-ups, internal innovations, setting up incubators or buying solutions from established tech vendors, established payments players could innovate. According to him, the inhibitors to collaboration are commercial diligence requirements, operations readiness to scale, security concerns, liability concerns and regulations. LankaClear Ltd, General Manager and CEO Channa de Silva believes its efforts will be an encouragement to banks, financial institutions and fintech companies which are committed to drive continuous innovations in the payment technology space, thereby taking customer convenience to new heights. Presenting a narration on glimpse of the future, he said going forward people may not need a wallet or a purse at all as long as they had smartphones to do their transactions. He shared how QR Code, mobile apps, unique nicknames or payment exchange name (PEN) could be used as efficient payment methods, which were gradually becoming popular among most Millennials and the urban community. Delivering a technical presentation, Novus Technologies Ltd. President and CEO Ricardos Khoury shared insights on retail banking and retail delivery channels, particularly covering areas such as customer experience management, omni-channel transformation and mobile payments as well as key digital innovations. Khoury has extensive knowledge in ICT and retail banking working in many markets in France, Middle East and Mediterranean basin. His exposure to over 50 countries around the world equipped him with a deep cultural understanding and acute business sense that is helping to introduce innovation and add value to banks and financial institutions across the Asia Pacific. State Finance Minister Eran Wickramaratne stressed on the importance of sharing the benefits of innovative electronic payment products throughout the country that will benefit the economy as a whole. Wickramaratne said he is fully supportive of the digitalisation and the use of new technologies which promote and enhance the efficiency of the common payment infrastructure to drive financial inclusivity in Sri Lanka. Being at the award ceremony the State Minister said he learnt many new innovative payment methods that had been introduced to the market to improve efficiency of payment mechanisms. “I learnt about digital begging and I also learnt that it is making life easy for lawyers, doctors and tuition masters to receive their payments very quickly with all these different payment systems. I fully support it and it also records every payment, therefore the country is benefitting,” Wickramaratne pointed out. With rapid technological advancements and increasingly dynamic lifestyles, consumers of services have become increasingly mobile in their behaviour. Hence, being able to carry out their business, occupation or daily chores from wherever they are has become the new norm of convenience. The services they consume have to be omnipresent or location-independent and must address their mobile lifestyle needs. Against this backdrop, LankaPay Technnovation Awards 2018, conducted under the theme ‘EC – Recognising Excellence and Convenience’, intends to recognise the payment technology innovators who have successfully addressed the emerging lifestyle needs of people by taking customer convenience to new heights. Initiated last year in a quest to drive financial inclusivity in the country, which is a key objective of the Central Bank, the LankaPay Technnovation Awards intends to enhance the efficiency of the country’s national payment network. Award criteria for 2018 considers interbank payments during the period 1 April 2017 to 31 March 2018. The initial shortlisting was carried out based on the performance of individual banks, non-banking financial institutions and FinTech service providers against a set criteria defined and communicated at the beginning of the period, which will also be subjected to an independent audit. During the second phase of judging, the shortlisted winners needed to present how they achieved that performance to an independent and eminent panel of judges. The Chairman of the panel of judges of LankaPay Technnovation Awards 2018 was Former Secretary to the Ministry of Telecommunication and Digital Infrastructure Wasantha Deshapriya, who played the same role at the previous year’s competition as well. The other members of the panel of judges were Asite Talwatte FCA, FCMA, MBA (Sri J) – Chairman, Management Systems Ltd. and Past President CIMA and CA Sri Lanka; Lasantha Wickremasinghe – Past President, Institute of Chartered Accountants of Sri Lanka and Partner BR De Silva; Rajeeva Bandaranaike – Chief Executive Officer, Colombo Stock Exchange; Dulith Herath – Founder and Chairman, Kapruka.com; Jagath Perera – President, CA Sri Lanka; and Anushya Coomaraswamy, former Director, John Keells Holdings.